Wild Turkey is a Net Entertainment (NetEnt) slot that revolves around the story of a group of wild turkeys who live in an ancient Mayan stone temple. While the slot is not loaded with bonus features, the presence of a wild icon that appears stacked in the free spins game can add a large number of coins to players’ pile of winnings. Wild Turkey is played just like any other NetEnt slot. The slot has 20 paylines and players should first select the number of lines they would like to play. They can bet up to 10 coins per active payline, choosing from coin denominations in the range of $0.01 to $0.50. Players can bet up to $100.00 per active payline, making Wild Turkey an ideal slot for high-rollers as well as low-stakes players. Next, players can hit the Spin option to spin the reels, create winning combinations, and collect payouts. The theme of NetEnt’s Wild Turkey slot is rather unique, amusing, and entertaining. The game is all about a few turkeys that live in an ancient Mayan temple. A delightful combination of Mayan history and nature, the slot challenges players to mingle with a Mayan tribe, learn their culture and lifestyle, and win incredibly big prizes. The reels feature icons of turkey warriors and high-value cards that are carved out of stones. The Wild Turkey icon substitutes for the other icons on the reels and helps players complete winning payouts. Since Wild Turkey slot does not have any scatter icon, the Wild Turkey icon helps players unlock the free spins bonus round too. If players land at least three Wild Turkey icons anywhere on the reels, they will unlock the free spins bonus round. The number of free games players will get, however, depends on the number of Wild Turkey icons that helped unlock this feature. Accordingly, players will receive 15, 30, or 60 free spins for 3, 4, or 5 Wild Turkey icons, respectively. The free spins bonus round is associated with stacked wild icons. The Wild Turkey icon appears in the stacked form only during the free spins feature. Sometimes, it appears as a single icon, and at other times, it appears in stacks of twos and threes. If the Wild Turkey icon appears in stacks of threes and covers the entire reel, players will receive two more free spins. Players can win an infinite number of free spins during the free spins bonus round. 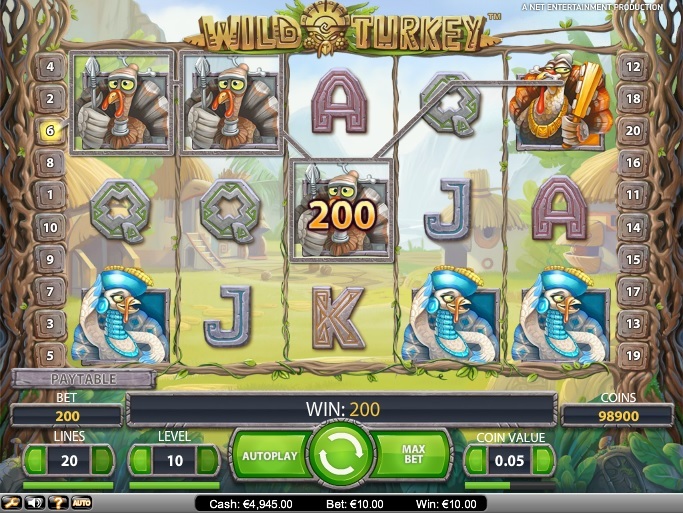 Wild Turkey is popular simply because of its unique theme, stacked wilds, and a top fixed jackpot of 4,000 coins, which players can win by landing a combination of five King Turkey icons along an active payline. The slot is available for fun or real money at all NetEnt-powered online casinos.